"40th exhibition of the American Institute, of the city of New York. Report of judges upon J. Hyde Fisher's refrigerators. 1st best. Circulation of air most perfect is not only dried but washed and purified by being brought in contact with the water on the surface of the ice, thus freeing it from the various impurities and flavors expelled from different articles being preserved. The airbeing pure, admits of preserving food at a higher temperature, thus requiring a smaller quantity of ice than otherwise. [Signatures of Rec secretary, Cor. secretary and President]." -- Verso. "Patented August 1st, 1865. Re-issued january 31st, 1871. New patent November 19th, 1872. They work on natural principles, scientifically applied. Are as cold as ice can make them, and have a pure dry air that I challenge the world to equal. All orders will receive prompt attention. State, county and individual rights for sale. Address: J. Hyde Fisher, p.o. box 170, Chicago, Illinois." 1 trade card : 9 x 14 cm. Exhibit title: Fisher, J.H., Chicago, Ill., Exhibit #585a, Agricultural Hall, Bldg. #152. 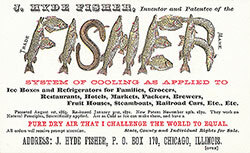 Trade card with recto bearing trademark of J. Hyde Fisher refrigeration system with "Fisher" spelled out using positioned fishes. 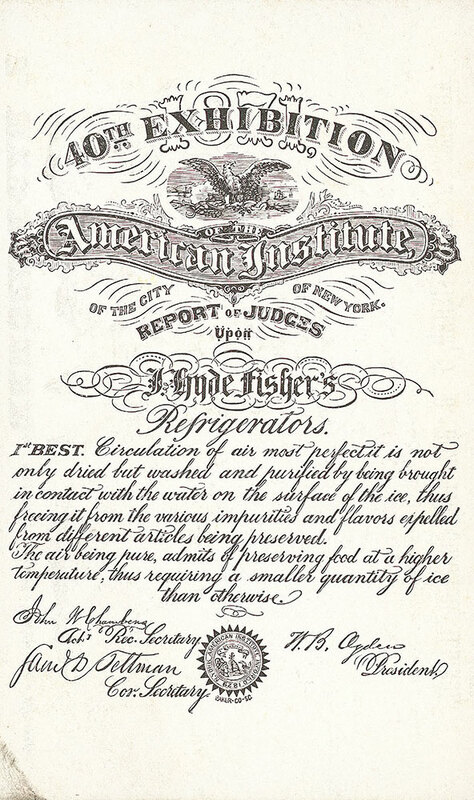 Verso is an endorsement of Fisher refrigerators by the American Institute, signed by its officers and containing its seal. Black, red, green and yellow ink on white card.